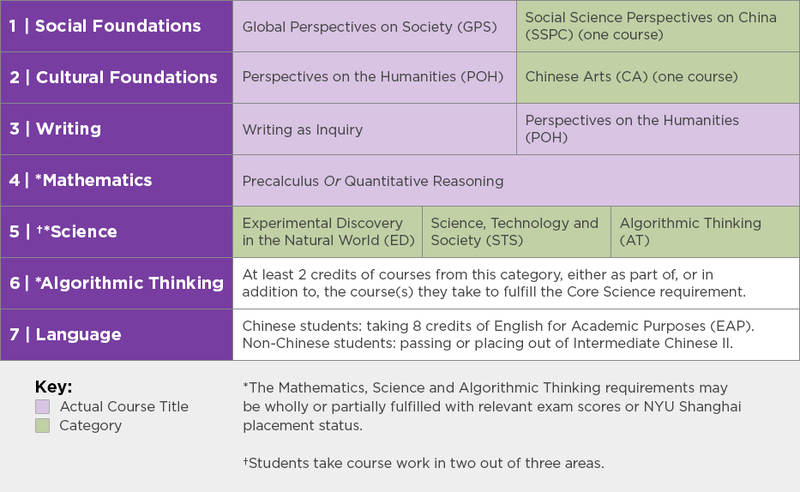 There are 7 components to the NYU Shanghai Core Curriculum: Social Foundations, Cultural Foundations, Writing, Mathematics, Science, Algorithmic Thinking, and Language. Upon arrival, each student’s needs in these areas will be assessed, and a program of study will be developed to address them. Courses in the Social Foundations and Cultural Foundations sequences will provide students with a thematic framework within which to study influential works of diverse cultures, from the beginnings of history to the present, and from global and interdisciplinary perspectives. Students will reflect on fundamental and enduring questions about what it means to be human and how we as individuals live in society. 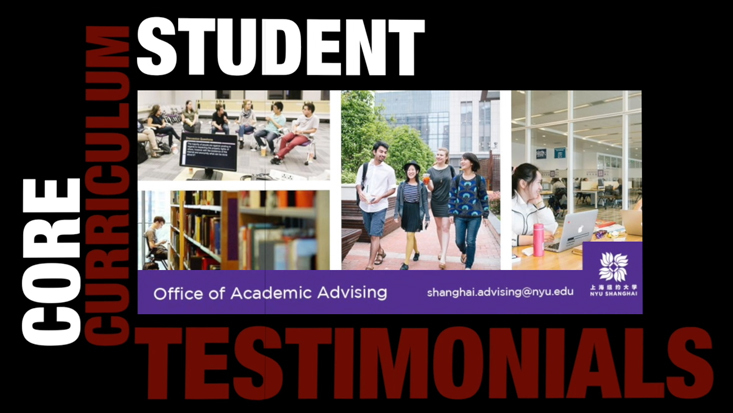 NYU Shanghai writing courses serve as an introduction to academic writing and inquiry at the university level. Students learn how to read academic, argumentative, and narrative texts closely, how to provide an interpretation supported by evidence, how to build logical arguments and develop research questions, and how to adapt their writing to different genres and audiences. Considered by many to be the “universal language,” mathematics provides logical and analytical tools necessary for tackling many of the important problems of our time. Quantitative skills are essential for work in the sciences and the social sciences, and have applications in the humanities. They are also critical to one’s ability to function and thrive in today’s increasingly complex world. Scientific knowledge and inquiry are central to human society, and science and technology play an increasingly important role in our lives. At the heart of the natural sciences is a quest to understand the universe and who we humans are. The special feature of science is that its hypotheses can be tested under controlled conditions by appealing to evidence external to the inquirer. Thus, science provides a consistent framework for proposing ideas and testing potential answers to these questions. NYU Shanghai students will become conversant with the intellectual methods and analytical techniques that define modern science. 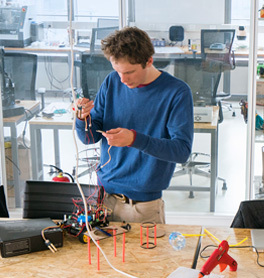 These courses have a hands-on programming component and cover basic programming concepts. All students must complete at least two credits of Computer Science courses from the Algorithmic Thinking category, either as part of, or in addition to, the course(s) they take to fulfill the Core Curriculum Science requirement. 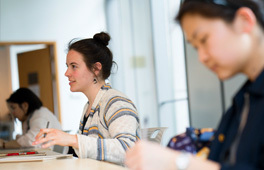 Language study is central to the educational mission of NYU shanghai. All NYU Shanghai students will be expected to become fluent in academic English, the language of instruction, as is expected for undergraduates in the world’s top liberal arts universities. Your high school exam scores may be used to wholly or partially fulfill Core Curriculum requirements. Click here to see what they fulfill.